Grad School: Year 4 | Team Alzen! Time to put another one down in the books. Grad school year 4 has come to a close. I’m now a 5th year. What?! This year started off with me finding out I won a dissertation grant competition about three weeks before I was scheduled to have our baby. This was exciting news but also meant that I had to start over on the dissertation work I had done all summer. We had assumed I wouldn’t win the competition and had moved on with another dissertation project. The great news of winning the competition meant that I needed to get started on the other project STAT. I threw together the worst draft of a prospectus ever and submitted it right before going into the hospital. I also participated on my research team for about three weeks before that time. My advisor was so incredibly gracious about the whole thing and was immensely kind in his feedback on the piece of garbage writing I handed to him. Once I went into the hospital on the morning of September 15, I took 3 months off. The transition to being a parent was HARD for me, and I’m thankful that my life was in a place where I could take that time to figure out my new life. As a result, the fall semester consisted of about 6 split weeks of participating in research meetings and working on my dissertation. Once January rolled around, parenting was getting the teensiest bit easier, and going to campus gave me some much needed escape. Over this semester I took a class, wrote my dissertation proposal, and yesterday, I successfully defended it. I am now ABD! The prospectus defense process was really positive and wonderful for me. I felt encouraged, validated, and supported. My committee members were all very complimentary of my writing and ideas and I felt like were truly there to give helpful guidance. I couldn’t have asked for a better experience. Grad school continues to be just wonderful. A friend today told me about evocative genes. Wikipedia says this relates to “when an individual’s (heritable) behavior evokes an environmental response”. Meaning perhaps I have some heritable characteristics that the grad school environment caused to flourish. It seems to be true. This environment has been so great for me. I’m very thankful. Plans for the summer include teaching online classes, making a quilt (or maybe two! ), teaching our little housemate how to sew, some leisure reading, figuring out a new regular exercise plan, working for my advisor, potentially picking up one or two other limited side jobs, exploring my dissertation data, and, you know, starting to write my dissertation! My kid is very clearly going to start crawling soon. I’m wondering how working is going to go with a mobile little child. I’ve been “sleeping in” until 6 or 7 for two years now, but I think my time of getting up to work around 5 is going to return very quickly as quiet work time when I’m not distracted by an adorable child who could injure herself if left to her own devices is going to become very valuable. We shall see what new practices arise as I find out what works for our family. 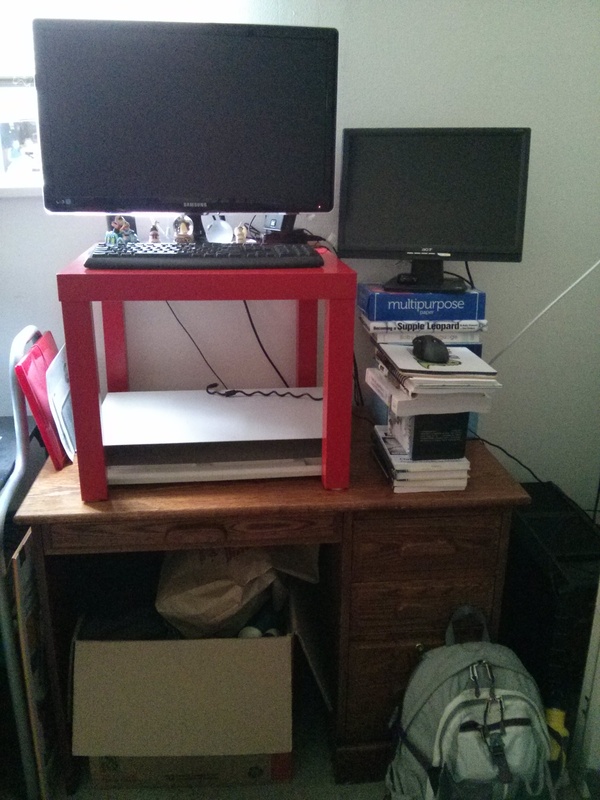 I started today by setting up my standing desk again. I’ve spent far too much time on the couch since little AB was born, plus there’s a nice big empty area near my desk where a little girl could play. I will perhaps look for a more suitable stand for my mouse and mouse pad as my Chronicles of Narnia box set is a little wonky, but it will work for now. Yay, you — congrats on this next step of your PhD journey! !